Big Boys Gone Bananas! * first US broadcast on December 1. 20 million americans can watch the movie on DirecTV AUDIENCE Network™. 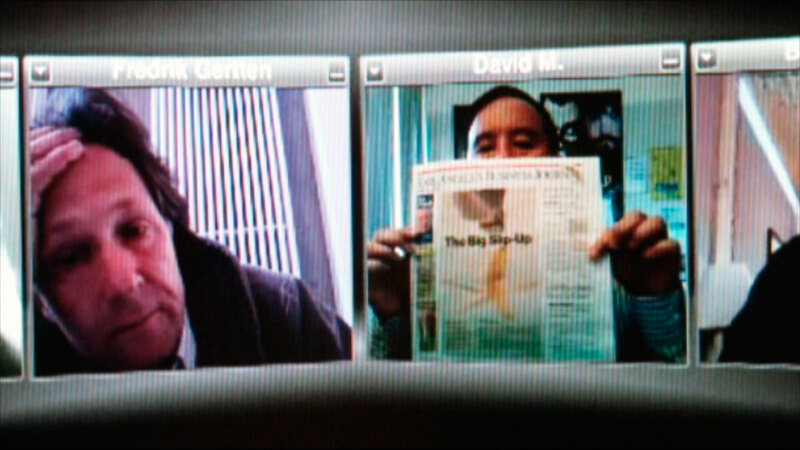 The show also includes an exclusive interview with director Fredrik Gertten. The film already screened in San Francisco and Seattle in the series. Today it continues around the US. 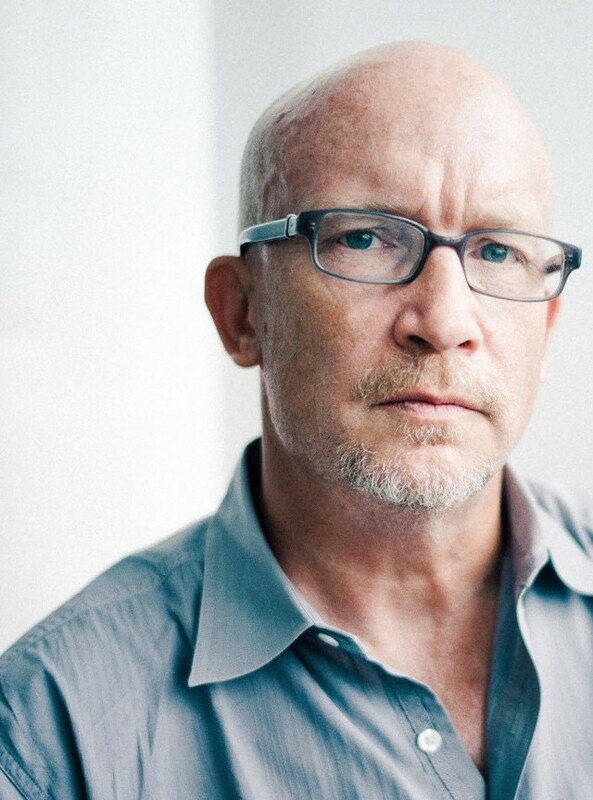 Filmmaker Alex Gibney presents the film and a special interview with Fredrik Gertten. BIG BOYS GONE BANANAS! * on tour in the Netherlands! 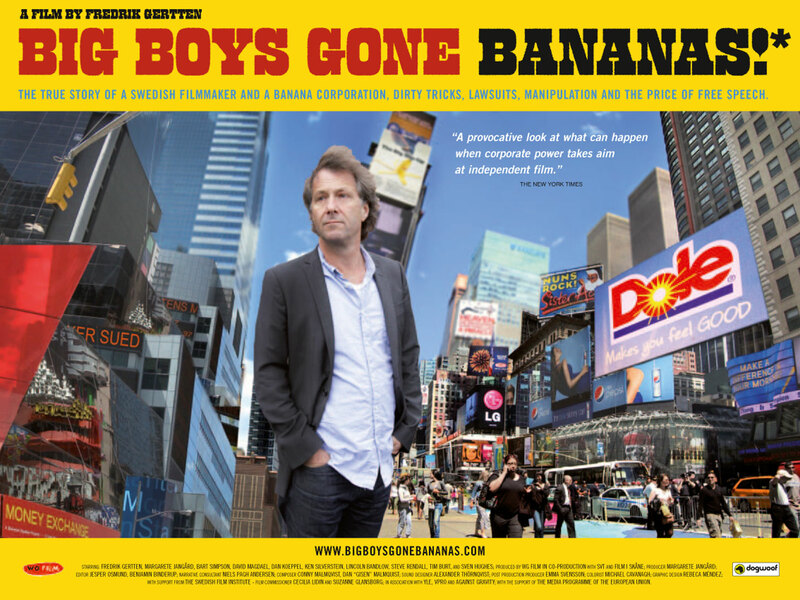 One year after the world premiere at IDFA, Amsterdam, BIG BOYS GONE BANANAS! * goes on tour in the Netherlands. Movies that matter organize a one month tour to fifteen cities with start Sunday the 4th of November. 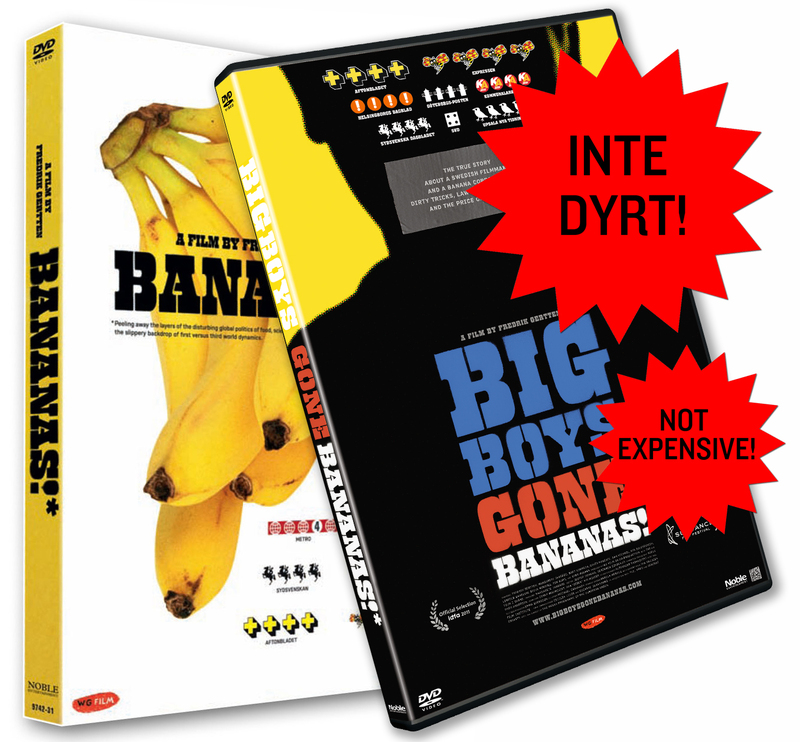 After the successful screenings at Nordisk Panorama 5 Cities Film Festival this weekend, BIG BOYS GONE BANANAS! * is ready for national broadcast in Finland tonight (27/9). This will be the first screening on television since SVT (Swedish national television) in May. 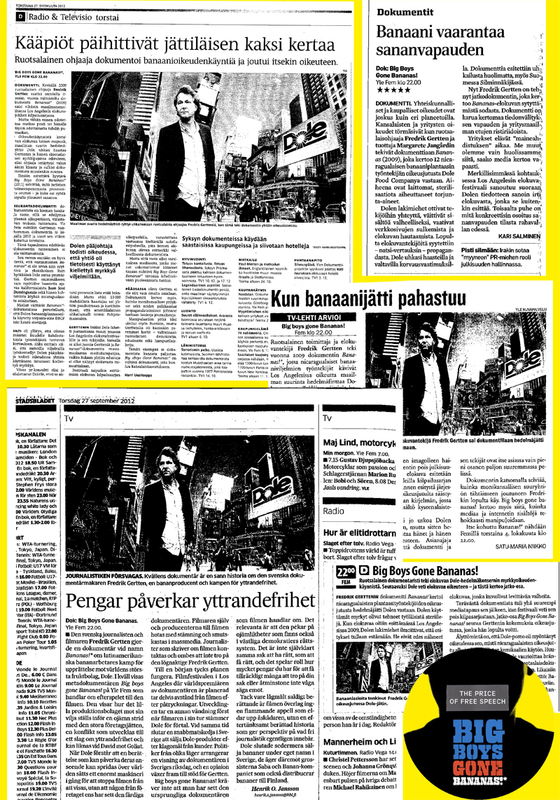 This morning the director Fredrik Gertten recived a snow dump of press clippings from Finnish newspapers announcing the big premiere. Take a look at this! One week at the Greenwich Picturehouse, London! Just confirmed: BIG BOYS GONE BANANAS! * will screen on Greenwich Picturehouse cinema starting this Friday! Sceening dates below. To buy tickets please visit www.picturehouses.co.uk. Fri 21 Sep 18:30, Sat 22 Sep 15:30, Sun 23 Sep 20:40, Mon 24 Sep 13:00, Tue 25 Sep 15:30, Wed 26 Sep 18:30, Thu 27 Sep 13:00. 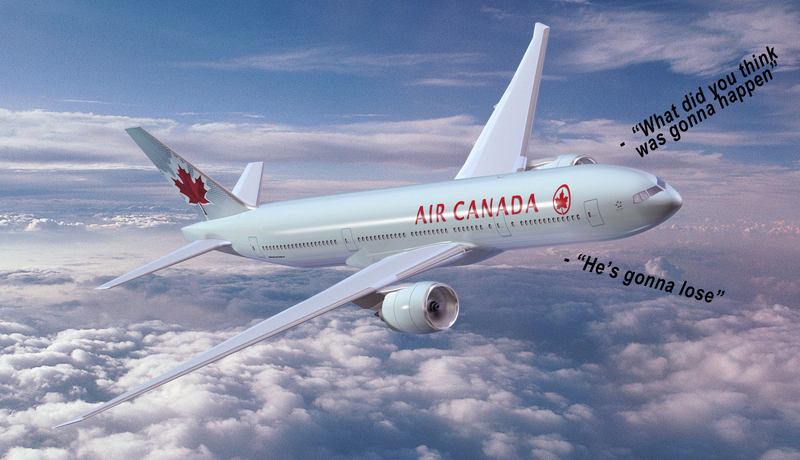 Air Canada loves good docs! From 1 of September to 31 of October you can watch BIG BOYS GONE BANANAS! * on Air Canada. The genre of documentaries is growing stronger, now we hope other airlines will get inspired. Let's hope Scandinavian airlines will follow! "I was moved to tears, here's 100 K"
Last month a man who wishes to be anonymous, donated 100,000 SEK (around 11,500 EUR) to WG Film. He was very moved after watching BANANAS! * and BIG BOYS GONE BANANAS! * and decided he wanted to help us in the making of new documentaries. A contribution that was moving, and needed! Why? Read proucer Margarete Jangård's interview about our financial situation. If you would like to help financially, you can make a donation here on our website. If you don’t feel like donating, there is still a lot you can do. Go and see the film in cinemas, and bring your friends. Or tell your friends to buy a DVD, when they become available in your country. You can help us by spreading the word about us, tweet about us and tell friends and colleagues about us. There’s a lot you can do! BIG BOYS GONE BANANAS! * IS HITTING UK CINEMAS! Big Boys Gone Bananas! * is hitting UK and Irish cinemas on September 21st and Fredrik Gertten will be coming over to the UK for the release. Dochouse will be hosting a special preview Q&A screening with Fredrik and Sven Hughes and chaired by Jen Robinson on Tuesday 18th September at 6.30pm at the Prince Charles Cinema in London. Book tickets here. Cambridge Picturehouse will also be hosting a preview and Q&A with Fredrik on the 19th September as part of the Cambridge Film Festival. The film is presented by our UK disitributor Dogwoof, who also gave out previous film BANANAS! * in UK 2010. Read more below! Now we sell both films BANANAS! * (2009) and BIG BOYS GONE BANANAS! * (2012) at a cheap package price in our webshop. Buy both films for 25 EUR in our webshop. If you order for more than 50 EUR you get the shipping for free! Take me to the webshop! In 2009 Fredrik Gertten went to US with BANANAS! * and got disbelieved and had to face PR scare tactics, dirty tricks and lawsuit from Dole. Today the situation is reverse. WG Film won and this time around Fredrik got a lot of support, interest and love when he came to screen BIG BOYS GONE BANANAS! * for two weeks in New York City and Los Angeles. Fredrik Gertten also went togheter with lawyer Lincoln Bandlow and publicist David Magdael to Michael Moore's 8th annual Traverse City Film Festival where the film was second runner up to the Audience Award. Directors Morgan Spurlock, Fredrik Gertten and Alex Rivera at Quad Cinema, New York. We have had some wonderful people helping us out in the US and of course all of you that came to the screenings and gave us so much good energy and love. In both New York and Los Angeles we had Q & A:s with special guests together with Fredrik Gertten and lawyer Lincoln Bandlow. We like to thank our amazing guests that helped out by moderating Q&A:s and made our screenings something really special: Joe Berlinger, Morgan Spurlock, Ondi Timoner, Lucy Walker, Elise Pearlstein and Leslie Wayne from 100 Reporters where all so lovely and we are so grateful for your wonderful support! “I am so grateful and honored to have my US filmmaking colleagues join me in these events where we can discuss freedom of speech, corporate intimidation and the future of making non-fiction films,” said Fredrik Gertten.